It’s always sad to come to the realization that another camping season is winding down. Depending on where you live, part of this realization is preparing the RV for winter storage so it will be ready to go camping again next spring. A major part of winterizing your RV is to protect the RV water system from potential damage, caused by exposure to freezing temperatures. RV Buzz Tip: Frozen and damaged water lines are in fact the most common problem related to not winterizing your RV, or not properly winterizing your RV. The RV plumbing system is the most vulnerable system to damage caused by plummeting temperatures. The good news is, it is easy to protect the RV water system from this potential threat. Here are my top 7 steps to winterizing your RV plumbing system. 2) A water heater by-pass kit, if not already installed. 3) A wand to clean out the black water holding tank if the RV doesn’t have a built-in black tank clean-out system. 4) A water pump converter kit, or tubing to connect to the inlet side of the 12-volt water pump. 5) Basic hand tools to remove and install drain plugs. Note: Be sure to read your RV owner’s manuals for unit specific winterizing guidelines. Follow all steps below that apply to your RV. Step # 1: If you have any inline water filters remove and bypass before starting. Drain the fresh water holding tank. Drain and flush the gray and black water holding tanks. If the RV doesn’t have a built in tank flushing system clean the black tank out with a tank cleaning wand. Drain the water heater. Open the pressure relief valve and remove the drain plug. 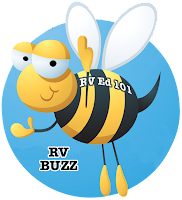 RV Buzz Caution: Never drain the water heater when it is hot or under pressure. With no water hooked up to the RV and the water pump turned off open a hot water faucet to remove any pressure from the system. Allow the tank time to cool before draining. Step # 2: Open all hot and cold faucets; don’t forget the toilet valve and outside shower. Locate and open the low point water drain lines. Use the water pump to help force most of the water out of the system, but turn it off as soon as the system is drained to prevent damaging the pump. Recap all drains and close all faucets. Step # 3: By-pass the water heater. If you do not have a by-pass kit installed the water heater will fill up with RV antifreeze before it goes through the water lines, wasting six or ten gallons of antifreeze. Step # 4: Install a water pump converter kit, or disconnect the inlet side of the water pump (the line coming from the fresh water holding tank) and connect tubing from the water pump inlet into a one gallon jug of RV antifreeze. Step # 5: Turn the water pump on and pressurize the system. Starting with the closest faucet to the pump slowly open the hot and then cold valves until the pink colored RV antifreeze appears. Replace the antifreeze container as required. Repeat on all faucets from the closest to the farthest away. Don’t forget the outside shower. Step # 6: Flush the toilet until antifreeze appears. Pour a cupful of antifreeze down each drain. Pour some RV antifreeze in the toilet and flush into the holding tank to prevent any water in the tank from freezing. If your water heater has an electric heating element, turn it off. This will protect the element if the unit is plugged in while in storage. Make sure all faucets are closed. Step # 7: Consult your owner manuals for winterizing icemakers and washing machines. The unit is winterized. Now, next spring when it’s time to head out in the RV you won’t have any unpleasant, not to mention costly, surprises waiting for. For more information on this topic check out our Winterizing & Storing your RV DVD.